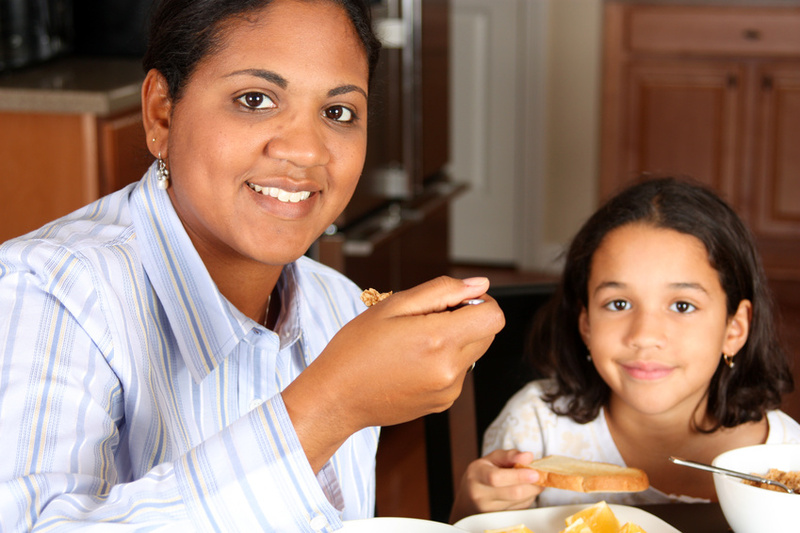 You have probably heard all of the studies about breakfast being the most important meal of the day for children – but did you ever think about it being as important for you, the parent or employee? Literally breakfast means “Break the Fast”. For most of us it has been at least eight and probably more like ten hours since we last ate and our body is in need of refueling. So what are those breakfast benefits? Many people think that if they skip breakfast they can help their diet, or lose weight – but the opposite is probably true. Breakfast ups your metabolism, which helps you burn more calories during the day. Studies show that those of us who eat breakfast consume less calories during the day, and are better at getting the nutrients that we need for the day. Numerous studies show that children who eat breakfast are less likely to be absent or late to school, and are less likely to have stomach aches or headaches. They are able to concentrate better, make fewer errors, and are more creative and work faster. Other studies show that children who eat breakfast are more cooperative, get along better with others, cause less fights, and spend less time in the principal’s office for fights. Breakfast eaters tend to eat less fat during the day and those who skip breakfast tend to have higher blood cholesterol levels. A high blood cholesterol level is linked with an increased risk for heart disease and other chronic health diseases. To get your family off to a good start each morning make every attempt to include three food groups – think dairy, grains, fruits, vegetables, or protein/meat. Breakfast is an easy place to get in a whole grain to improve your fiber consumption. There are many whole grain cereals and breads, as well as bagels, English muffins, and pita style wraps. Include a fruit or veggie too – sliced fruits in your cereal or top of your cream cheese or peanut butter on a slice of toast are easy. I love to put dried cranberries or raisins in my low fat oatmeal – then I don’t feel the need for butter and brown sugar. So what are some quick ideas? Try a wheat wrap with light cream cheese or peanut butter and sliced fruit. A favorite of mine is a low fat yogurt with fresh fruit and a little high fiber cereal for crunch. Why wait for lunch to have a sandwich – whole grain bread (maybe toasted) with lean ham and a slice of cheese is easy to take with you. Grab a 100% juice box or pour some juice in your beverage container and you are ready to go. If you have a few minutes to blend – try a smoothie with low fat yogurt, fresh or canned fruit, milk or juice, and a couple ice cubes. Some people even throw in a carrot. Toss a handful of whole grain crackers in a bag, grab a piece of fresh fruit (apples, bananas, a Clementine, a handful of grapes or blueberries, or a fresh peach or plum), and a cheese stick make for easy transport. Grab a bag or small bowl with lid to make your own snack mix – mix a couple dry cereals with cheese crackers, dried fruits, pretzels, and maybe a couple chocolate chips. This has been a quick favorite of my daughter for years – if she doesn’t eat it all in the car on our way in the morning, she has an afterschool snack before soccer. Make a batch of whole grain, pumpkin, or fruit muffins – eat some now and freeze the rest to eat in a week or two with your skim milk or juice. Try replacing part of the oil in the recipe with applesauce to make them healthier. Breakfast is important to our children and for us too – why wouldn’t we want to be more cooperative, get along better with our co-workers, concentrate better and work faster – just like they do. Make it a priority by purchasing foods to make that morning race go smoother. Author: Lisa Barlage, Extension Educator, Family and Consumer Science, Ohio State University Extension. Clemson Cooperative Extension, Hunter & Cason, http://www.clemson.edu/extension/hgic/food/nutrition/nutrition/life_stages/hgic4106.html. Utah State University Cooperative Extension, Williams, http://extension.usu.edu/saltlake/files/uploads/pdf/BreakfastMostImportant.pdf. University of Wisconsin – Green Bay, Hess, http://www.uwgb.edu/counselinghealth/wellness/hu/BenefitsOfBreakfast.pdf.